Wouldn’t it be great to train in the comfort of your own home? Like, properly train. Be able to drill techniques, drill positions and spar as much as you like. Just like an open-mat class. 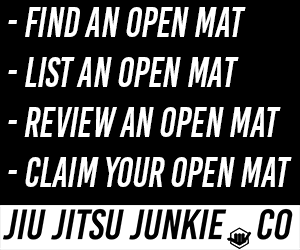 One of the best things about open mat classes is the freedom to train exactly how you choose. Sometimes you go to class and you have to learn a technique that you just don’t care about, or have already trained multiple times. But when open mat comes around, you can train whatever position and submissions you like. Unfortunately, at a lot of gyms, open mats are few and far between. Maybe you’re lucky enough to have a Saturday or Sunday open mat class but for a lot of people, they only get that freedom on the rare occasion when an instructor is ill or otherwise disposed. Luckily for you, you can have your own set of mats at home. Good quality mats too, just like you’d find in a professional BJJ and MMA gym. Most of the mats available on this list can be swiftly tidied away when not needed and easily cleaned and disinfected after use. But of course, if you have the room, you can have your mats set up and ready to go at all times. If you’re fortunate enough to have warm weather, you can even set the mats up outside and invite all your martial arts buddies round for a barbecue and impromptu competition! There’s a ton of good mats on the market, and a fair amount of sub-par ones too. We’ve done the hard work and research for you and collated the top 5 home mats below for your perusal. These mats are constructed with high-density, cross-linked polyethylene foam for the mat itself and an 18oz vinyl covering. The vinyl makes cleaning these mats a breeze. Whether giving them a quick wipe down or a full-scale disinfectant clean. These mats come as a stack of 4 connected rectangle mats that fold out to form a larger rectangle in which to train on. Version 4 of the Z-Athletic mat range allow you to purchase extra units and attach them together to create an even bigger mat space. If you’re one of those people lucky enough to have a spare room in their home that you can dedicate solely to training BJJ, then you could cost-effectively mat out the entire room. The mats connect end-to-end and side-to-side so you can customise your mats to fit whatever shape room you have. The primary benefit of this Everlast folding mat is ease of use. You can unfold it and chuck it on the floor and you’re done. You’re ready to go. No having to spend your valuable time having to connect and assemble them. When you’re done you just fold it back up and tuck it away. When folded, the two sides form a handle so you can move it about with ease and even travel with the mats. Perfect for BJJ trainees who are on the move around the country but still want to keep up with their training when they can’t find an adequate gym. The non-absorbent shell makes cleaning the mat easy and makes sure that it doesn’t soak up sweat and begin smelling. We’ve all rolled on stinking mats before and it is not a pleasant experience. IncStore supply you with an ample amount of options with their roll out wrestling mats You have 9 colours to pick from and 3 different sizes, leaving you with a total of 27 different choices you can make. These are professional looking mats that are ideal for both temporary and permanent placement. They roll out and roll back for easy clean up and storage but are perfectly suited for matting out an area permanently as well. They are both light and compact when fully rolled up, making them the most mobile of the mats on our list. You can purchase multiples and stick them together with mat tape, leaving no cracks that can catch and break toes. The thick foam padding provides a soft impact when practicing takedowns, judo throws and full control sparring. These are the typical mats you see in most gyms. If you’ve trained at a few different places over the years, you’ve 100% seen this mat set-up before. The foam tiles interlock together on all sides and fit together like a jigsaw puzzle. You can even buy the bevelled edges as well to make the ends of the mat seamless and edged, without the teeth fittings hanging off of the edge. Interlocking jigsaw mats are purchased tile by tile, with normally 4 tiles as a minimum order. This means you can be much more precise with just how much mat you need. No overlap, no missing spaces. Buy the exact amount of tiles to fit your space. IncStores sells two styles of the mats: Black and grey reversible and blue and red reversible. If you feel like being particularly snazzy you can mix and match the tiles to create your own design. Depending on available space of course. Dollamur make professional competition wrestling mats and MMA mats. You’ve likely already seen their work in top-ranked wrestling events, BJJ competition and on the floor of top gyms around the world. Now you can buy the same high-quality standard of mat as you would expect in professional venues, but for your own home. The mat itself is 1.25” thick and is split into two 5’x10’ parts that only weigh 20Ibs each. Even a child could roll them out and set them up. The mat is surface-treated with Bio-PrufTM antimicrobials to prevent dirt and infection from causing mischief on your mats. If you purchase more than one unit, you can connect them together with mat tape to have an even larger training surface. It’s really hard to fault these Dollamur mats as they are perfect for using at home now and then again or putting them down for good.